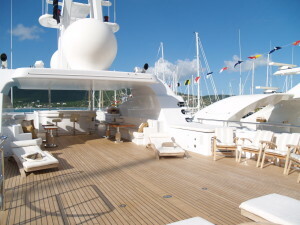 Step aboard the luxury yacht that was once known as High Chaparral and find out as to why although the name may have changed, it’s astounding features and high-class opulence are still just as great as ever. If you do decide to rent a luxury yacht like that of Troyanda, it won’t take long to see that it’s unparalleled design is first and foremost what makes it stand out from all the rest in its class. Designed by the designers at De Voogt Naval Architects, its 50-meter (164 foot) grandeur featuring a core made entirely out of steel, a superstructure component made mainly from aluminum, a KoopNautic zero-speed stabilization that helps ensure maximum comfort at sea/anchor, and insulation to make certain your eyes don’t hear the roaring engines, you will find that every detail has been modified to the highest of standards. This means you can rest assured the superyacht you spend your days at sea on is nothing short of an extremely impressive and fully reliable power boat eager to get you wherever you decide to go. Convince your partner along with 5 other couples to hop on board the Troyanda with you and you will be making use of all its available accommodations. 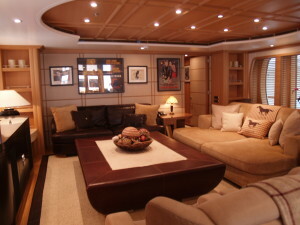 In other words, the luxury crewed yacht charter is able to hold up to 12 guests where you each will enjoy rooms easily accessible through the main central lobby, your own dressing rooms, bathrooms, and bedside cabinets for any trinkets or treasures you might bring along or acquire throughout the trip. All beautifully and tastefully decorated to ensure privacy, style, and comfort each time you lay your head down to rest. This idea to rent a luxury yacht like Troyanda is sounding pretty good right about now, isn’t it? Not only will you enjoy spending time in your fantastic rooms, but you will also get the chance to make use of the outdoor facilities available at your disposal. 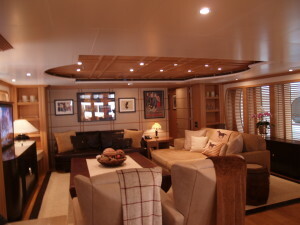 Spend your days lounging on the sundeck while listening to the music of your choice through the outside stereos, indulge in dinner prepared by the onboard professional chef in the shaded dining area for up to 20 people (in case you make friends along the way), and get cozy in one of the plush sofas located on the bridge deck areas. You’ll find that no matter where you are while on board the luxury yacht Troyanda, there is always something to enjoy and make use of. If you need help finding them, rest assured that the friendly and helpful staff and crew will point you in the right direction until you find what you are looking for and are fully satisfied and comfortable. 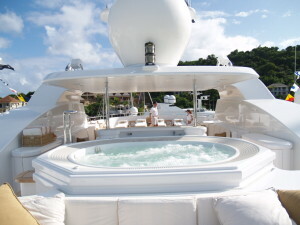 No matter what your questions may be, we have the answers and are ready to help you along each step of the way in planning your dream yacht charter holiday aboard the magnificent luxury yacht Troyanda. Contact us today or call us toll free on 800-478-2029 or international callers dial +1 954-720-0475.